Instead of bringing us closer to God, and each other, the topic of giving is murky for most believers. Interested in advancing the giving culture in your organization? Give a Plastic Donuts book to each member of your development team, or to your entire staff. Or have me speak to your staff or your conference. They will appreciate the gift… and the perspective. Donors want to know their gift matters to your organization, but they also want know it matters to God. Both high capacity donors and small gift donors are equally touched and inspired by this message. 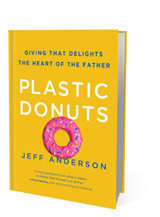 Plastic Donuts deliver four simple, biblical truths that help people understand giving from God’s perspective. The message brings both freedom and challenge: freedom by having biblical clarity about how God sees our gifts; and challenge from what God’s word clearly says. Buy here – or please contact us for bulk purchases. Jeff Anderson is a longtime friend. He is highly qualified to share the principles and practices of generosity with others because he personally lives them. Want to become more generous? Learn how from Acceptable Gift. Jeff is a man who walks his talk. God is using him to deliver a compelling message of generosity to this generation. Every time I am with him I am challenged and encouraged to live more generously.